March is Nutrition month in Canada and the 2nd annual Canadian Living (CL) questionnaire on nutrition and eating habits is out. Although I was not involved in this research (with 7000+ respondents), I found the high level findings very interesting. A few tidbits below! Eighty percent of the CL study still drink cow milk but a huge number of people also consume non-dairy choices: 41% drink almond milk, 18% drink coconut milk, 12% drink soy milk, and 3% drink hemp milk. A few years ago, our family tried all the options available. We opted for almond milk. I don’t mind soy but learned from an unfortunate experience that it CURDLES in coffee! Yuck! And then there is Hemp milk. I have no idea who can drink this. It looks horrible, smells horrible and tastes horrible. I would love to hear what options your family enjoys! The Canadian Living study also indicated that many of us are using vitamin supplements, with vitamin D being the most common. While we Canadians tend to hibernate in the winter months it is almost impossible to get enough vitamin D from the sun, so this is a good thing. But did you know that mushrooms are also a source of vitamin D? Apparently, they are the only vegetables that provide a natural dose and their nutrition becomes more “bio-available” when you cook them. (However, you would need to eat an awful lot of mushrooms to get to the dosage recommended by Health Canada.) 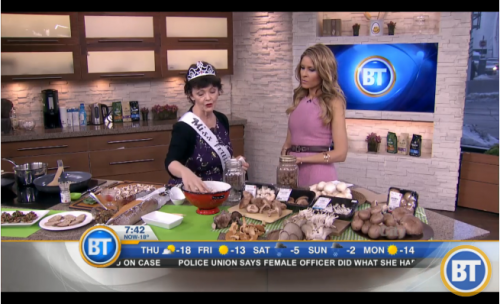 There was a fun segment on ways to enjoy mushrooms recently on Breakfast Television with one of my favourite presenters, Mairlyn Smith. Click on the picture below to connect to the video. I find it almost impossible to believe that a third of Canadians are so disciplined that they have, “kicked sugar”. We Canadians are not that strict with ourselves. If we were, we wouldn’t be so fat! According to Statistics Canada, in 2011-2012, 25% of Canadian were obese! This is a 17.5% increase from 2003. There is a scary obesity epidemic today. However, I am not blaming sugar as the primary culprit! I eat and enjoy sugar (in moderation most days) but we have major issues with our sedentary lifestyle and overall, poor diet choices. I think it’s great that the media is highlighting “Nutrition month”. Anything to remind and help us to make better food choices can’t be a bad thing.